The clock is now counting down to International May 12th Awareness Day 2019. 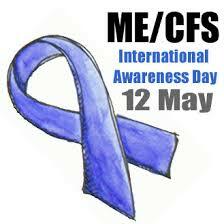 This year, 2019, marks the 27th anniversary of International May 12th Awareness Day. The idea originated with Thomas Michael Hennessy, Jr., the founder of Repeal Existing Stereotypes about Chronic Immunological and Neurological Diseases (no longer active). Tom Hennessy was based in the USA but understood that it needed to be an international event; he designated May 12 as the International Awareness Day for the spectrum of illnesses he called Chronic Immunological and Neurological Diseases (CIND). May 12 was chosen as it coincided with the birth date of Florence Nightingale, the celebrated English social reformer and statistician, and the founder of modern nursing. Nightingale became chronically ill in her mid-thirties after returning from the Crimean War; the M.E.-like illness often left her bedridden during the last 50 years of her life. You will find a more detailed account in A Short History of M.E. Tom Hennessy included Myalgic Encephalomyelitis (also known as Chronic Fatigue Syndrome and Chronic Fatigue and Immune Dysfunction Syndrome), Fibromyalgia, Gulf War Syndrome and Multiple Chemical Sensitivity under the CIND umbrella. These illnesses, characterised by cognitive problems, chronic muscle and joint pain, extremely poor stamina, and numerous other symptoms, afflict people around the world in alarming numbers.